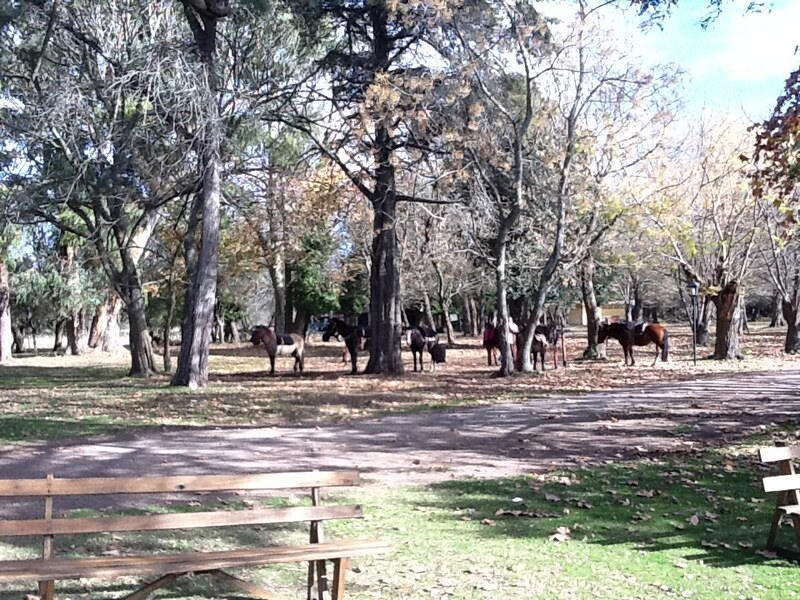 "Estancia" means "ranch," I'm told, and I went there yesterday on a bus. 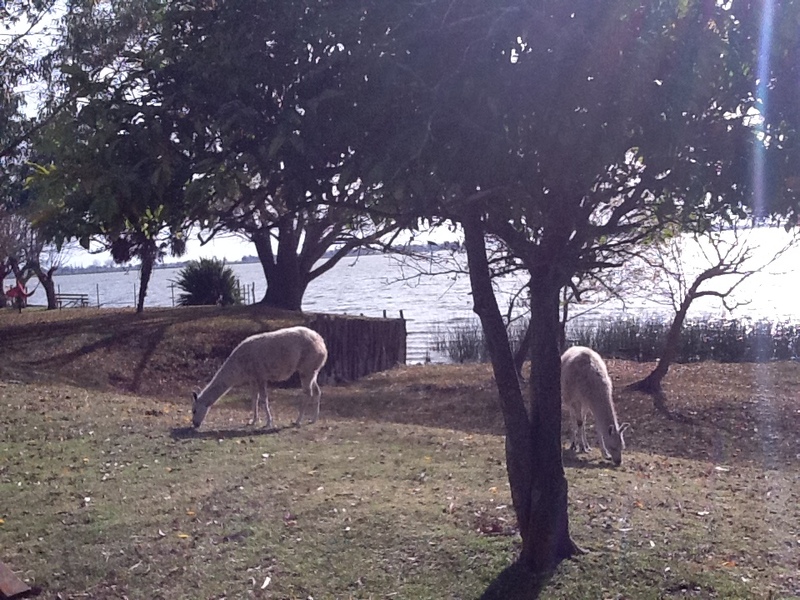 The day was cold and clear, and the estancia was located along a lake (actually, a laguna, which I'm told is different insofar as a lake is connected to a river while a laguna is closed off). There were horses and possibly-spitting llamas, which did not thrill me, but I kept my distance from them and they didn't bug me either. We both preferred it that way. 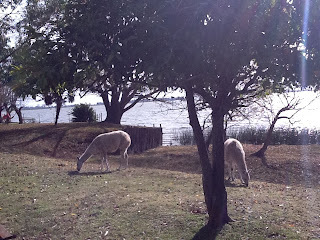 We all wandered around the grounds, taking care to avoid horse and llama droppings, which was more difficult than you might imagine because they were everywhere. Then we all stood around outside and had empanadas and drinks. I spoke to an Argentine guy about computer science and copyright in Spanish, which was thrilling more for the fluency of my comprehension than for the content (though the latter was very interesting as well). There was a great lunch in the parrilla style, which is kind of like a Brazilian churrascaria, where they bring meat around to the tables. It was all very delicious and traditional-seeming. Then there was some sort of dance show in the big hall where we all ate lunch, but I left before it began (not liking shows of any sort much), and went instead to the dock where I read some law cases and froze thanks to the icy wind off the laguna. Then the gauchos rode horses around the corral and we all watched as they did some tricks and, more amusingly, pulled people around on rugs behind their horses. By that time it was late afternoon and we all got on the bus back to Bs As. I slept for most of the way, and woke up when we hit city traffic. I woke up because our bus was surrounded by other buses, these all taking rowdy River Plate fans to their game that night at the Monumental v. Colon. They all leaned out the windows, waving flags and yelling and gesturing at us. It was interesting but I didn't really know how to respond. 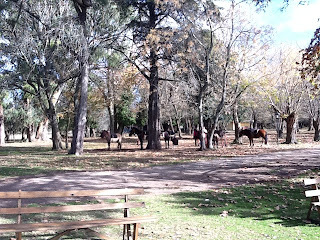 That was my trip to the estancia.